Genre: 2D Run 'n' Gun. 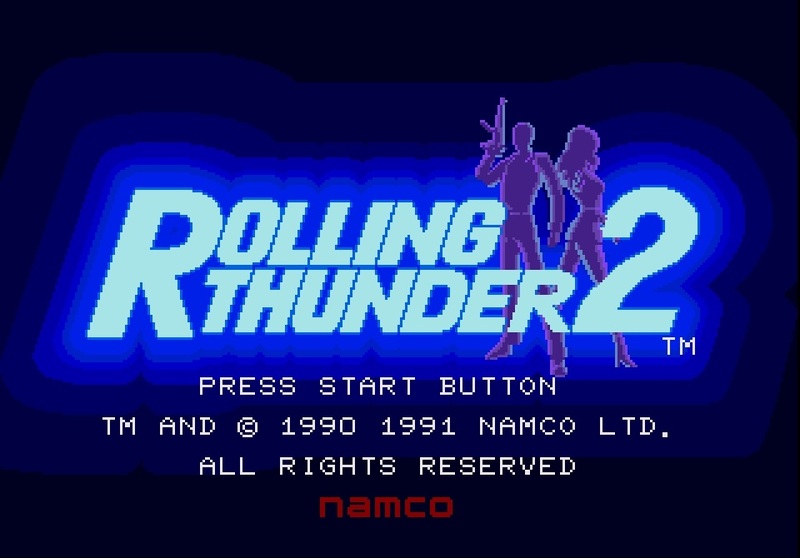 As the years pass and the 16-bit era becomes an ever-greater focal point for nostalgic remembrance, it’s interesting that, even as we’re often guilty of romanticising games and their achievements, a series of Rolling Thunder’s distinction appears seldom championed. For many, the name will draw no recollection at all, but we can’t blame modern gamers, or the march of technological progress for this. After all, even its own creators, Namco, seem content to forget it existed for long stretches, and whilst Pacman received the full fireworks ‘n’ bunting for his 35th anniversary recently, it’s hard to envisage anything more than a cursory footnote awaiting Rolling Thunder 2’s 25th birthday next year. It’s a bit of a shame, though perhaps the rapid development of the genre (and gaming as a whole) during the period contributed to this. Either way, the Rolling Thunder brand was consigned to history before it got the chance to take any fledgling steps in 3D, and although this run ‘n’ gun is a product of its time, it’s easy to overlook how accomplished, and stylish, a game it was. 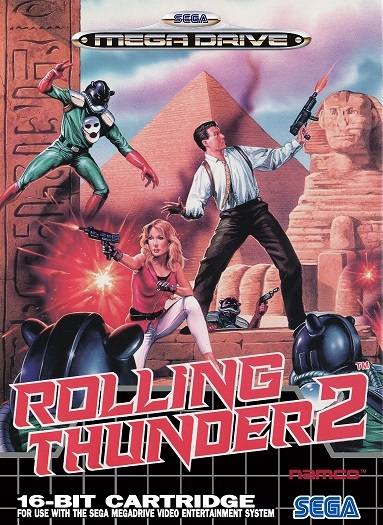 The middle entry in a trilogy, the first to appear on the Mega Drive and arguably the series’ finest outing, Rolling Thunder 2 is an engaging shooter that’s good in all departments. 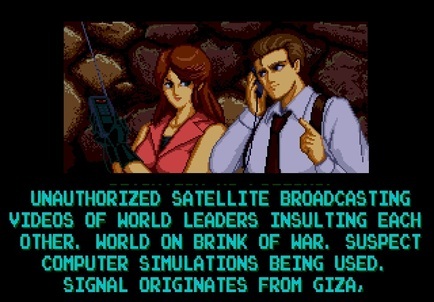 RT2 reveals its spy/thriller intentions as we learn of the re-emergence of Geldra, the terrorist organisation thought to have been eradicated in the original adventure. You’re given a (largely cosmetic) choice between agents “Albatross” and “Leila”, before hurtling into a breathless eleven level adventure. Lean and action-packed, Rolling Thunder 2’s levels are typically accompanied with a three to five minute time-limit to dissuade dawdling, and prove a distinctly arcadey affair. 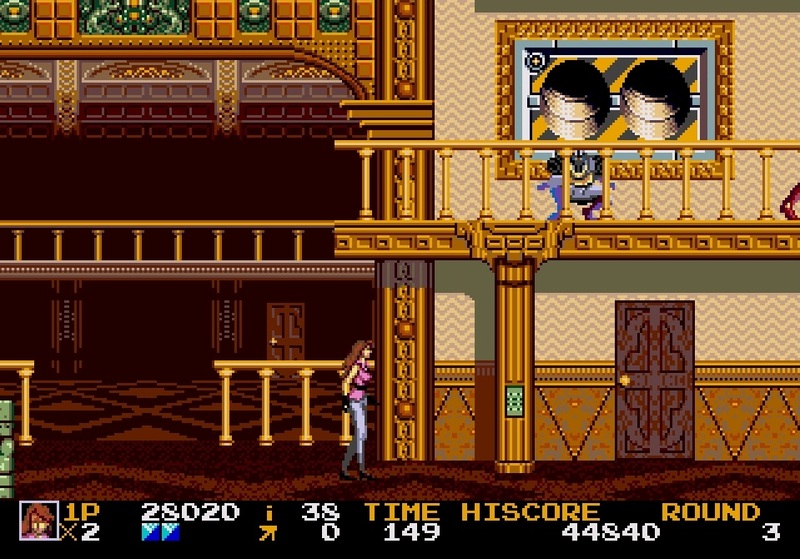 Hardly surprising, as it’s based on an arcade game, and it sticks impressively close to the coin-op. There’s little between them gameplay-wise, with the only noticeable differences being a slightly reduced colour palette (evident in the more extravagant backdrops) and the loss of a few animations, which leave some motions looking a little wooden. However, a spate of nice, console-specific mission briefings and the post-completion bonus of a Hard mode go some way to making up for this. Controls can be grasped in an instant, with basic jump and shoot functions joined by supplementary duck, cover and ledge-hop options to broaden your means of defence against the attacking hordes. 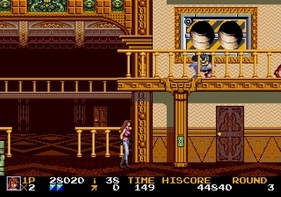 One of its greatest successes is demanding that the player uses many of them sequentially to hold off enemy onslaughts, with such instances becoming entirely intuitive (and consequently very satisfying) remarkably quickly. RT’s strong blueprint is built upon in small but meaningful ways as the levels unfold. Enemies that are little more than cannon fodder to begin with, gradually evolve into more deadly propositions. 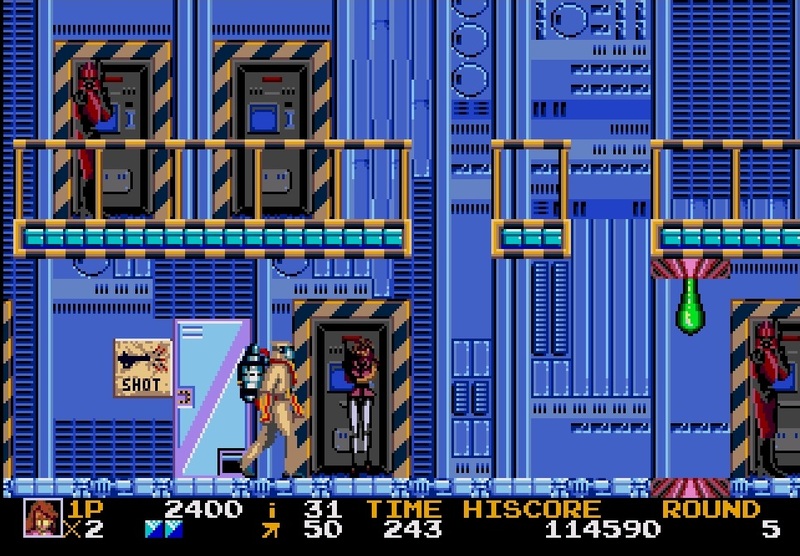 Some start employing the same crouch-and-fire technique that’s so useful to the player, and these can prove deadly if you’re not prepared, as bullets kill agents in one hit. As things progress, enemies can withstand more shots, fire pulse beams from cover, whilst stealth camouflaged baddies even band together to spring ambushes. The odd oversight takes the shine off the experience a little. A lack of directional aiming or the ability to shoot mid-jump greatly impairs the tactics available to the player. Furthermore, the player is considerably more vulnerable when travelling across higher ground, as foes can get off shots that are sometimes difficult to avoid or counter effectively, leaving you feeling unnecessarily vulnerable. Such difficulties are emphasised by the nuisance grenade-lobbers, who given half a chance, will chuck an unbroken sequence of bombs that are almost impossible to get around should you have approached the section too furtively. Visually, it again reaches an accomplished standard. The enemies don’t look a million dollars and jumping animations can be a little static-looking, and those expecting a hive of activity and explosions of colour may be disappointed. But it’s attractive in a tidy, refined kind of way. 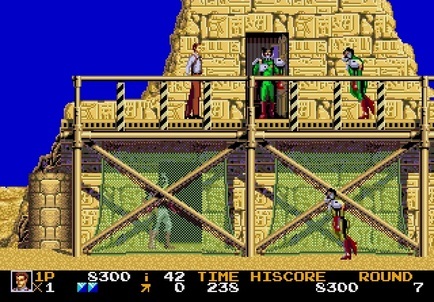 There’s a generous amount of background detail and an impressive range of locations, opening with a Miami villa, before jet-setting between labs, classic villainous lairs, military barracks and there’s even a trip to Egypt, complete with Sphinx and Pyramids. Outside of the gameplay, the presentation could hardly be better, as RT2 sets out its stall in no uncertain fashion with a slick and stylish intro sequence, whilst the attract screens are consistently dynamic. 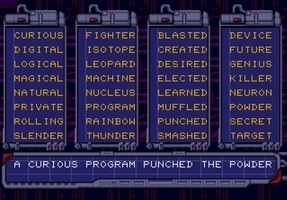 A minor touch on its own perhaps, the password system is nevertheless a wonderful touch, delivering input codes as a sequence of four words that, appropriately enough, read like a cryptic message (a Logical Leopard Blasted the Secret being a personal favourite). Action sound effects are crisp enough, and ably abetted by a fitting musical score that, for the most part, is of a very strong standard. 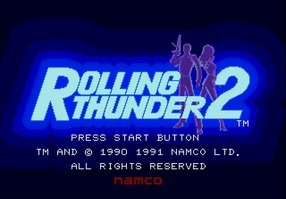 After coasting through the opening first few levels, Rolling Thunder 2 starts to put up some decent resistance, with the password system allowing for gradual progression without too much frustration, although limits on time and ammunition in the later levels mean you’ll have to be a smooth operator to pull off successful missions. A two-player co-op mode prolongs its shelf life admirably, as you and a friend can (provided you don’t distract each other) battle through together, which is a huge boon. Rolling Thunder 2 remains a sound reminder of solid game design. 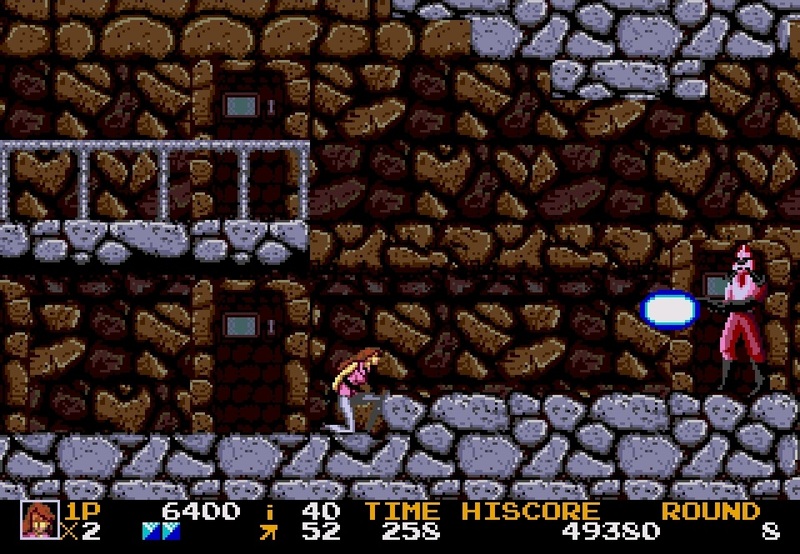 It may not be the fastest, nor the fanciest-looking run ‘n’ gun, but its occasional flashes of ingenuity, coupled with consistently strong level design and a smartly measured difficulty curve, make for a game that’s easy to appreciate for its qualities. 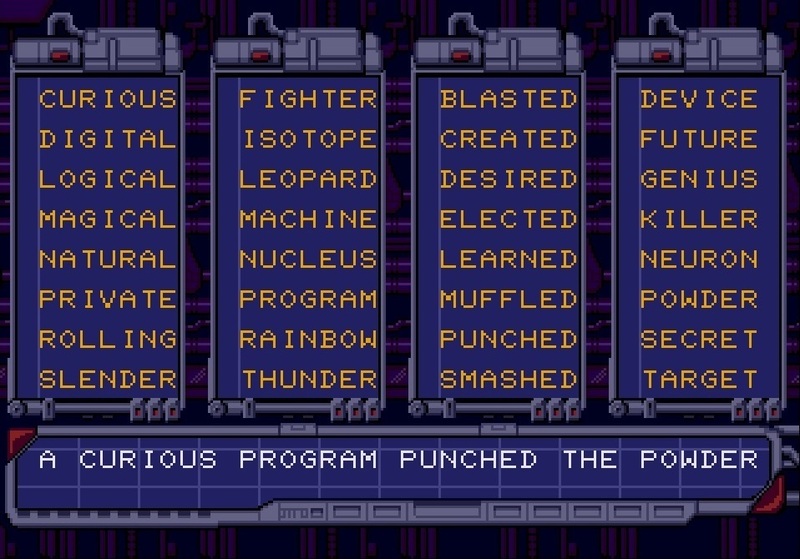 There’s a lot to recommend it, even if retrospectively it may seem a little sedate next to the Gunstar Heroes’ and the Metal Slug’s that followed.